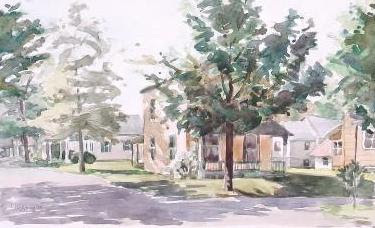 This watercolor was painted at the corner of Jackson and Wright, looking down Wright. I remember choosing this location and composition because of the patterns of shadows and trees on and around the peach colored house. Rather than being about the house it is about the light cutting through the space and the way that the trees define the neighborhood. The tree in front of the house is gone now, but the tiny one on the right hand corner has grown much taller.